300,000 residents have been without useable tap water for four days due to a chemical spill. In my book, water is one of the central topics, because it’s so important. Those reading my blog already know the importance of water and probably have water reserves, the ability to purify and treat water, and the ability to collect rainwater. The ability to draw water from a well or a river is great, but always allow for the possibility of chemical spills cutting off that supply. 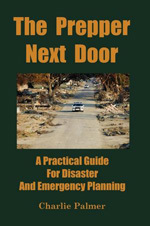 Use this as a teaching tool to encourage your friends, who you want to be preppers, to make modest preparations. Ask them if they have a four or five day supply of water reserves. I planned on writing a post about prepping for the new year, with an emphasis on fighting the one thing that hinders our preps, procrastination. We don’t give ourselves enough time to prepare. Start early and you’ll have an advantage over those who delay. Alas, it’s now the eleventh of January and too late for a New Years Resolution post. With record setting cold temps throughout much of the country, I thought we’d revisit preparing for extreme cold. This is a topic covered thoroughly in the book. Cold weather has killed car batteries, frozen water mains, and many have been without heat and electricity. Many outdoor survival instructors will teach shelter building and fire building first, because these help warm us and protect us from the elements. In the worst environments, though, fires are exceptionally difficult to light. It can be difficult to find fuel. These guys are bundling up for a trip to Antarctica. In most environments, a danger is that it will get above freezing and rain, so add rain gear to the list. If you’re equipped with the above clothing, you’re all set for the cold. It doesn’t matter if you’re forced to travel or stay at home. Everything has an important role. In extreme cold, you don’t want exposed skin. With this kit, you’ll be covered from head to toe, including goggles to protect your eyes. The best cold weather advice: If you have heat and don’t need to go anywhere, just stay warm inside until the cold snap passes.